The Fox & Hounds Restaurant and Bar01924 255474work Restaurant - PubThe Fox and Hounds is the oldest Public House in the Newmillerdam and Sandal area. It has recently been completely renovated to a high standard by the current owners Jackie & Nick who take great pride in acting as hosts to all of their customers, presenting them with the very best food and drink that also represents great value for money. Cask ales such as Timothy Taylor's Landlord and Jennings Cumberland are a regular serving there as well as guest ales such as Spitfire, Hobgoblin, Black Sheep and many more. They've even got Italian Peroni on draught!! The only pub in Yorkshire to have such an offer. There's a fantastic range of wines from around the world that are also available by the glass, as well as a large range of both Scottish and Irish single malt whiskies that includes Aberlour A'bunadh, a cask strengh (60%!) whisky and a beautiful 21 year old Balvenie (in Portwood) whisky. There's many more to choose from or you may prefer to finish your nught off with a quality XO cognac and when it gets a bit nippy we serve Mulled wine with mince pies..home made of course. The real gem of the Fox & Hounds is the restaurant, fast becoming known as the best place to enjoy genuinely freshly made quality food; whether it's a baguette with Jackie's infamous Chunky Chips (not frozen!) at lunch or a Fillet Rissini prepared by our Roseete winning Chef Paul, who along with his assistants Ruth and Nathan take great pride in producing mouth watering dishes for you to enjoy. The Fox & Hounds hosts many celebration parties now and caters for buffet parties up to a 100 and seated dining up to 60, as well as offering superb freshly made BBQ food to enjoy in the summer evening in the sunken garden area. Although new flooring, seating and decor have been installed the 'traditional' pub feel remains at The Fox & Hounds with regular live entertainment featuring on a Friday (Jazz & Blues nights) and Saturday with guest musicians appearing. As well as this, there are two quiz nights with the General Knowledge Quiz on a Wednesday night and the 70's/80's Music and Quiz night on a Sunday too. One of the only pubs where you can still enjoy a game of pool in the separate Games room area. All in all one of the best Restaurants and Pubs in Yorkshire and this was recognised when they were voted The UK's NO.1 PUB for 2009 by people in the trade in the Morning Advertiser- a great accolade. 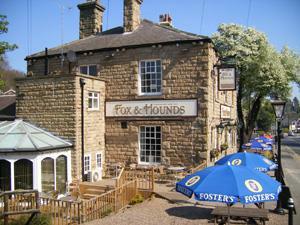 The Fox and Hounds is the oldest Public House in the Newmillerdam and Sandal area. It has recently been completely renovated to a high standard by the current owners Jackie & Nick who take great pride in acting as hosts to all of their customers, presenting them with the very best food and drink that also represents great value for money. Situated in one of the nicest areas of Wakefield, surrounded by woods and the lake providing opportunity for all the family to enjoy a day out. Even dogs (well behaved one's of course!) are welcome in the bar area where food is served, although they are not allowed in the restaurant. Easy to find on the main A61 Wakefield to Barnsley road, just past the lake on the right hand side when coming out of Wakefield. If coming via motorway you would take Jnc 39 southbound or Jnc 38 northbound. Nearest train station is Wakefield Westgate and the nearest Bus Station is Wakefield.The pub is on Bus Route 59. There is free car parking on site and parking with a charge opposite the pub.